How did Jesus approach his future? How did the changes of his day impact his horizon? What can we learn from his context that will help us create a more sustainable future? I’ve been thinking about these questions for some time. In 2008 Futures journal published a scholarly article I wrote on this subject. In this article I examine how Jesus shaped his mid-range horizon based on the the changes of his day. And I asked what we can learn from his context that will help us create a more sustainable 21st century. In the Galilean model I propose that Jesus saw the future as a dynamic of three paths: Conventional, Counter and Creative. Most people think Jesus was fixed on the long-range future, but I argue his focus was on dynamics that would play out in his society. A historical reading of Jesus in his social context in Second Temple Judaism is not new. My paper, however, attempts to resolve issues that scholars have yet to address. Jesus, like any strategic or global leader, likely envisioned various horizons of the future: the immediate, the near-term, the generation, and the long-term. This paper won a Citation of Excellence award, placing in the top 50 of 15,000 articles for 2008. I call this field contextual eschatology, with scholars writing on like N.T. Wright or Scott McKnight, along with more popular authors, such as Brian McLaren. This field contextualizes the notion of the kingdom of God, or its’ already/not yet poles to the decisive events which the Jesus movement faced, from the crucifixion of Jesus in 30 A.D. to the failed national Jewish Revolt in A.D. 70. I wrote this scholarly article to my peers, who teach futures studies at the graduate level. I encourage them not to overlook Jesus as part of the pre-history of our practice, just because Christian fundamentalism and Zionists misread apocalyptic literature. If you are faculty in a college or university context, in history, sociology, political science, theology, or leadership, and are interested in reading how Jesus relates to the both the crises of the 1st and the 21st century, please download this paper. I welcome your scholarly critique of the Galilean model, and how we can better read the dynamics of our worlds. 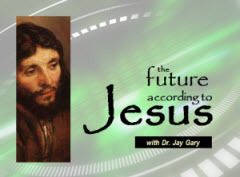 The Future According to Jesus is the first-part of a lecture series that Dr. Gary does for colleges or churches. 3. The horizon of the kingdom?